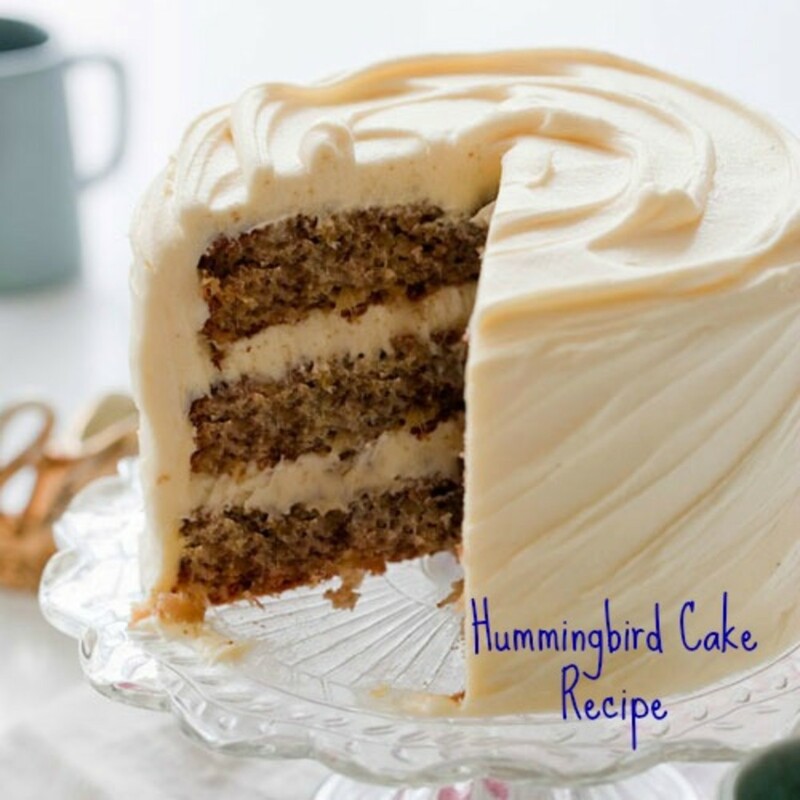 Hummingbird Cake has been a Southern favorite recipe for years, due to its taste, moistness, readily available ingredients and ease of making. What more could you ask for? What started out as a tasty and simple cake has become a "claim to fame" for many high profile cooks. 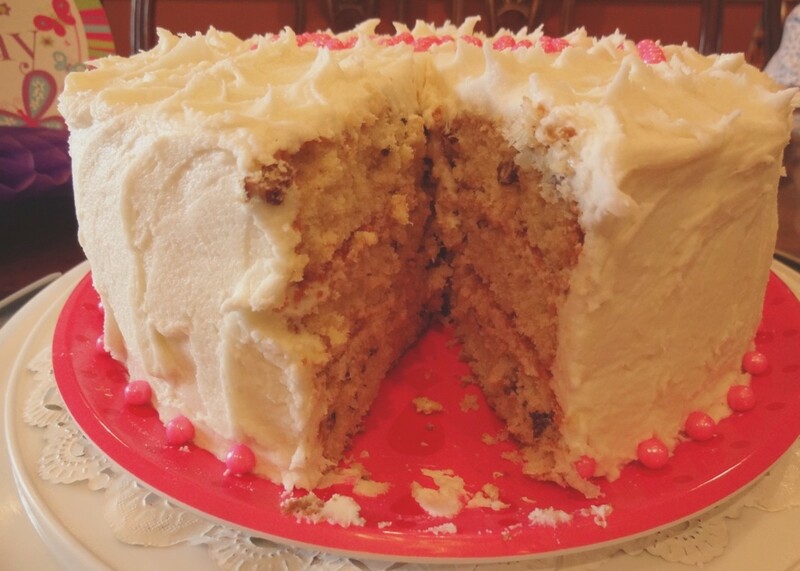 Paula Deen and Martha Stewart both have their versions of Hummingbird Cake. Southern Living magazine claims that they published the recipe first, in their February 1978 issue. However, I can remember my mother baking the same cake in the 1950s, without the fancy name of Hummingbird Cake. In our family we just called it Cake! No one knows how it came to be known as Hummingbird Cake. Some have said it tastes so good that you hum when you eat it. Others believe it is as sweet as hummingbird nectar. Regardless of the name, it is an award winning cake having been voted the "Favorite Cake" at the 1978 Kentucky State Fair. Truthfully, it is a very rich cake. But that's a good thing! It can be served in small slices so it stretches a long way for a large family or for a potluck dinner. Make certain the pecans are fresh. They have a high fat content so they spoil quickly. They can be kept in the refrigerator in an air-tight container for three months and in the freezer for six months. Don't forget to note the date on the container. Bananas become sweeter as they ripen and taste much better in this recipe. Very ripe bananas are also easier to mash and blend into the cake batter. You can replace the oil with butter if desired. However, using oil assures a cake that is more moist. Some people enjoy this cake without frosting (less sugar content!) but most bakers serve it with the Cream Cheese Frosting. Delicious either way. You can add whole maraschino cherries and pecan halves to the top of the cake which makes it very attractive on a nice cake plate. Remember, presentation is important. Put the cake in the refrigerator for at least an hour before serving so the frosting can set up firmly. Uneaten cake (if any!) should be stored in the refrigerator wrapped tightly with plastic wrap or in a cake carrier with a lid. Preheat oven to 350 degrees. Grease and flour well three 9 inch baking pans. In a large bowl, beat the oil, sugar and vanilla at medium speed on mixer until fluffy. Add the lightly beaten eggs, a little at a time, and beat all together well. In a medium bowl, combine flour, baking soda, cinnamon and salt. Add to the mixture in the large bowl alternately with the buttermilk. Add mashed bananas, undrained pineapple and pecans. Pour the batter into the three pans evenly. Hold the pans a few inches above the counter and drop onto counter to get any bubbles out of the batter. Bake 30 minutes then check for doneness by inserting a toothpick in the center of each layer to see if it comes out clean. When done, remove the pans from the oven and let cool for 10 minutes while the layers are still in the pans. Then remove layers from the pans and let them cool completely before frosting. Beat butter and cream cheese until smooth and creamy. Beat in sugar, vanilla and lemon juice. Frost between each layer first then frost top and sides of cake. You can leave the frosting plain or garnish with pecan halves, maraschino cherries (nice accent at Christmas) or chopped pecans as you desire. Lightly press the garnishments with your hand or fingers into the frosting. 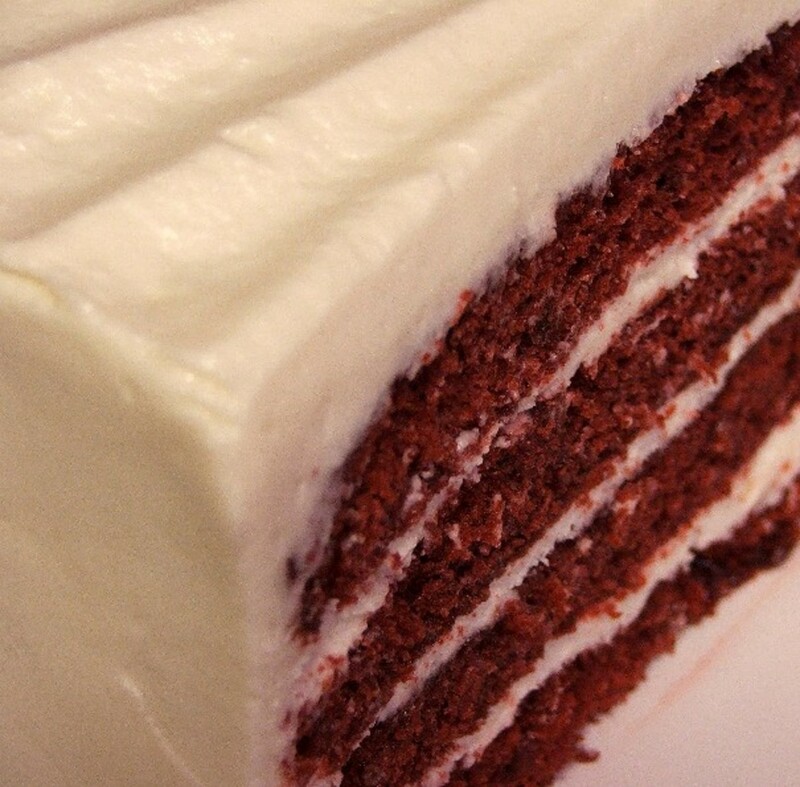 Refrigerate cake at least 1 hour before serving so the frosting has time to get firm. Refrigerate any uneaten cake. Have you ever eaten Hummingbird Cake? 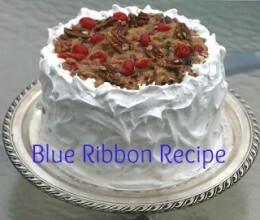 Recipe, baking tips and history of Lane Cake, a blue ribbon winner from an 1898 county fair and a Southern favorite. This cake is so mist and yummy! Thanks for recipe! Essie I have gotten some great reviews on this cake. It is pretty tasty! Thanks for reading and commenting. Wow! This cake looks delicious. I have not heard of hummingbird cake. Thanks for sharing the recipe. I have to try this. Voted up and shared to my fb account. Monis Mas it really isn't hard and the little bit of extra effort is so worth it! Thanks for your nice comments. randomcreative thanks for taking the time to stop by and read about the hummingbird cake. I appreciate your nice comments. I'm from the midwest and had never heard of hummingbird cake before, but it sounds delicious! Thanks for sharing this great recipe and for providing so much information about it. IslandBites welcome to HubPages! I look forward to seeing more of your Caribbean recipes. Thanks for the comment. billybuc I always enjoy and appreciate your comments. Thanks!!! Come on down south sometime, we don't bite! I have never heard of this, but of course I've never been to the South, so there you go. :) It sounds and looks delicious. Thanks for the recipe and nice job of including some history with the recipe. RTalloni thanks for your great comments about Hummingbird Cake. I hope if you adapt the recipe for people with allergies to cow milk that you will write a hub about it. Thanks so much! Very interesting to read about the history of the so-called Hummingbird cake. It makes me think of the proverb, "There's nothing new under the sun." :) Anyway, the cake is a fabulous treat. One day I hope to work on a version that uses coconut oil, coconut/almond milk, and goat's milk to replace the cow milk products (due to allergy). Before I knew that problems were due to consuming cow's milk I tasted this wonderful dessert. It could be my next choice after chocolate! :) Neat hub, thanks! prasetio30 I bet your Mom would make it for you. Thanks for your comments and voting up! Elisha if you figure out how to make it gluten and dairy free, that would make a great hub. Thanks for stopping by. I love hummingbird cake. I need to figure out how to make it gluten and dairy free. paxwill it is very sweet and delicious. But the best part it is so easy to make. Try it sometime. Thanks for your comments! Hello drbj ... glad I made you hum with this recipe. It really is worth humming about! Hello neighbor c mark walker from 2 towns away. Thanks for stopping by and for your nice comments. vocalcoach you are as sweet as the Hummingbird Cake for sharing it and voting it up. Thanks so much! rebeccamealey thanks so much for sharing my hub on your facebook page. I really appreciate it! I see you are from northeast Georgia ... I am in Blue Ridge, Georgia. Thanks Neighbor! bridalletter from the "Show Me" state of Missouri. Glad you like the recipe and that you are going to try it out. Let us know the results. Just Ask Susan I'm glad you are going to try the recipe. Let us know how you like it! moonlake I'm sure there are good cooks up north that know about this recipe too. Thanks for your comments! I've never eaten Hummingbird cake before, Thelma, but I am now humming with anticipation as I read your delicious recipe. Thank you. Haven't had a Hummingbird Cake in years. This looks like a good recipe Thelma with some good advice along with it. I'ts been a long time since I've had it and I didn't know it was officially called hummingbird cake, but it makes sense since it is soooooooo sweet! This is a 'too-die-for' recipe! And the additional tips you've provided are a nice bonus. Good photo. Sharing and voted up plus 5*. I have heard of hummingbird cake before, but had forgotten. Thanks for the reminder. It looks and sounds delicious. I shared on my FB. Thank you for sharing the recipe. I have it at tea rooms whenever it is available. I love the name of it too. I am positive I will try this recipe out myself. So many good ingredients in it. Oh my this sounds so good. Thanks for sharing your recipe and I can't wait to try it. We've ate this cake up north years ago, my mother=in=law made it. We ate it way before Martha or Paula. We also just called it cake. I'm from the south and don't remember my mom or any family member making it. Enjoyed your hub voted up.